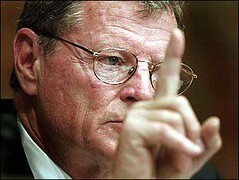 As I’ve written before, the war on global warming science goes something like this: Whenever it gets really, really cold somewhere in the United States, people like U.S. Sen. Jim Inhofe and his family make fun of former Vice President Al Gore, a well-known environmentalist, and smugly claim victory. In particular, the Inhofe family igloo story, as they say, had legs and was widely covered. So what happens in the media when the tables are turned and there are record high temperatures in winter months? Not much, it appears. According to the National Weather Service, Oklahoma City reached a record-breaking Dec. 20 temperature of 77 degrees on Monday. The old record was 73 degrees. This resulted in a short article in The Oklahoman by the Associated Press. To be accurate and fair, shouldn’t the local media ask Inhofe and his family about their thoughts on the record temperature since they obviously believe you can determine whether global warming is real or not through individual weather events? The point here is that you can’t determine global warming through one weather event, whether it’s a cold or hot one. Global warming scientists have also long predicted that climate change would actually result in unusual weather patterns, creating stronger storms, such as the February snowstorm in Washington. But one storm or one particular day of extreme weather doesn’t prove anything conclusively by itself. At the very least, the media here needs to keep this record high temperature in mind when Inhofe and/or clan pull another stunt mocking Gore.